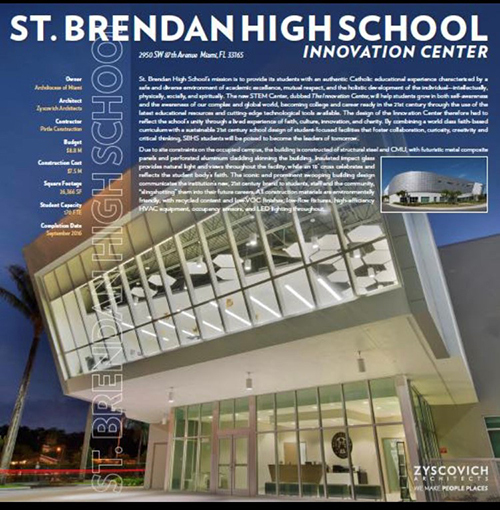 St. Brendan High School’s Innovation Center, dedicated in September 2016, earned a first place for school, college and university design from the Florida Educational Facilities Planners’ Association (FEFPA), the state’s leading authority on educational design excellence. 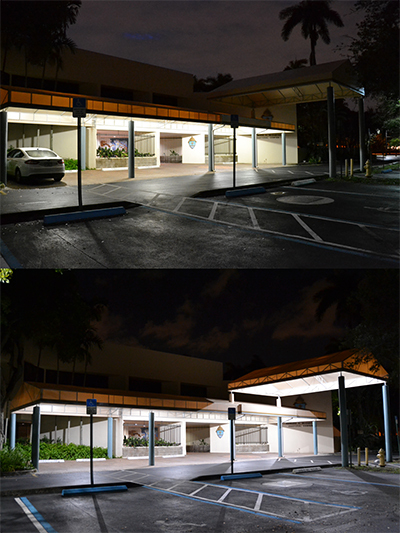 Before (above) and after photos of the Pastoral Center entrance, before and after the installation of LED lights. MIAMI | The Archdiocese of Miami received good news on two fronts this week. It saved $1 million on energy costs over the past three years, and one of its school buildings was recognized for outstanding architectural design. David Prada, senior director of the Building and Property Office, touted the news via emails. After meeting with representatives of Florida Power and Light last month, he said the archdiocese “has continued to reduce its carbon footprint and saved significant energy dollars” throughout Miami-Dade and Broward counties. Monroe County is served by a different power company. Between 2015 and 2018, archdiocesan entities in both counties — parishes, schools and offices — reduced their energy consumption by over 10 million kilowatt hours, resulting in over $1 million in savings. “The ADOM has actually increased the number of FPL accounts it has (more buildings) and still been able to reduce energy consumption and costs,” Prada said. By switching to LED lights, high efficiency air conditioning systems and controls, and high efficiency roofs, the archdiocese’s consumption and costs went from 110,134,535 kwh and $11,373,839 in 2015 to 99,726,019 kwh and $10,118,471 in 2018. The other good news involves St. Brendan High School’s Innovation Center, dedicated in September 2016. It earned a first place for school, college and university design from the Florida Educational Facilities Planners’ Association (FEFPA), the state’s leading authority on educational design excellence. 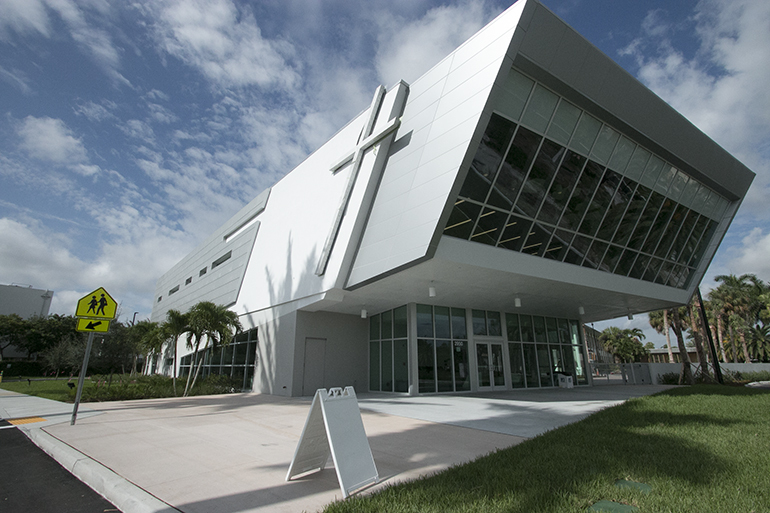 “Congratulations to the Archdiocese of Miami and Zyscovich Architects’ Education Group for winning one of its highly coveted awards,” Prada said. FEFPA awards are based on seven criteria including: innovative response to educational program; aesthetics and use of materials; flexibility for community use; technology provisions; green design; relationship of spaces and expandability; and site development. The building had earlier won a 2017 Outstanding Project Award of Excellence from Learning By Design magazine. The Innovation Center comprises state-of-the-art STEM (science, technology, engineering, mathematics) laboratories and classrooms, common areas where students can gather for group projects, private study and socialization, an auditorium/flex space, a television studio, and offices for administration and the guidance department. The new "face" of St. Brendan High School along S.W. 87th Avenue, the 24,000-square-foot, state-of-the-art Innovation Center.